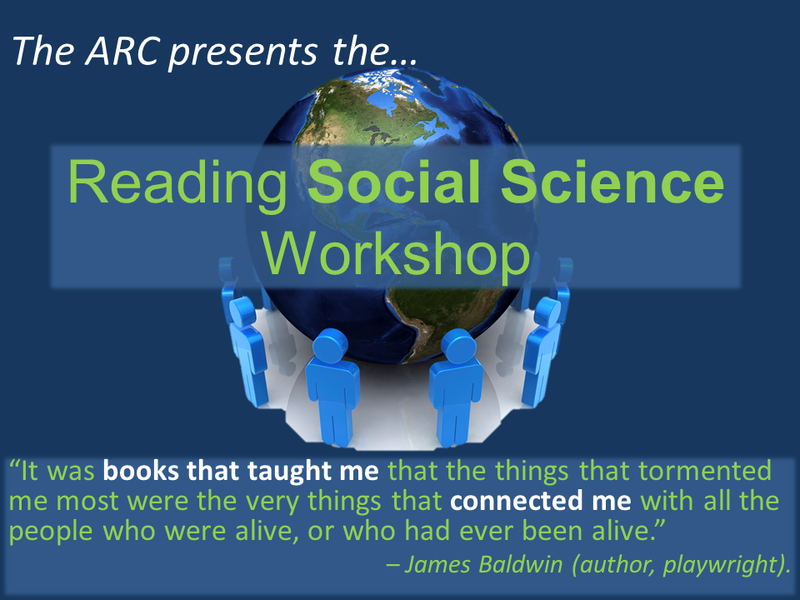 The Reading Social Science Workshop | Save My Reading Life! The social sciences (including anthropology, history, ethnic studies, psychology, sociology, economics, and some philosophy) study the very essence of what it is to be human. Part of what many students enjoy about the social sciences is that it gives them a feeling of connection with themselves and others; it allows one to begin to understand some of the most mysterious and universal things in existence: love, hate, violence, money, politics, culture, social status, religion, familial connections, and much more. These are topics that mankind has been trying to understand–and master–for a very long time. Read the title, author information, key terms, introduction, and/or the abstract or summary. Reading the headings and subheadings throughout the article or chapter. Read the first and/or the last sentences in each paragraph. Look at the bolded, italicized, or any other emphasized terms; also look for any words you do not recognize. You may want to take a moment to look up what any words mean before you begin reading, too. Examine any picture, charts, tables, and any other graphics. Read the chapter summary, end-of-chapter questions, reviews, and any other information at the end of the chapter or article. Each section of a text provides the reader with important information that you must pay attention to in order to make the most of your reading. For instance, if you’re writing a research paper that requires that you use statistics or quantitative information, you will want to locate that information within the paper and spend extra time interpreting it for you own research. 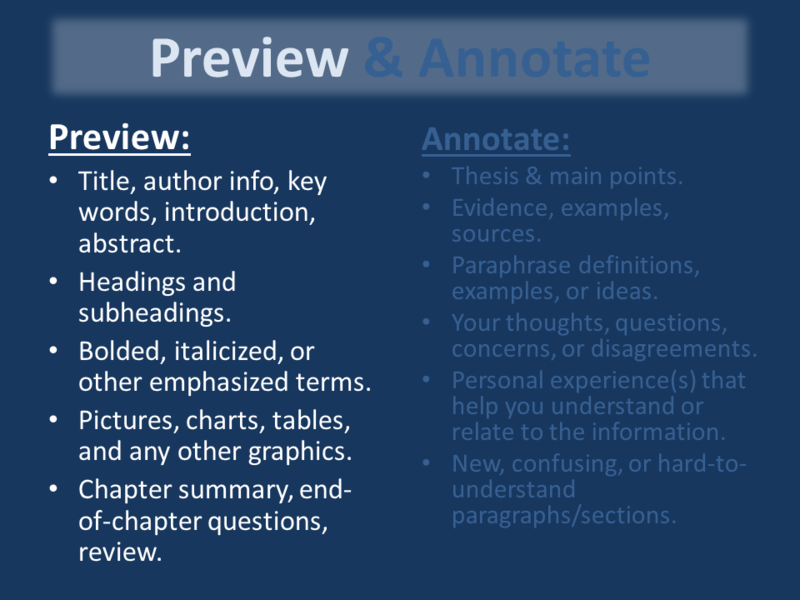 If, on the other hand, you must read to gain background information for a class discussion, you may want to spend more time on the background, results, and author motivation areas. In any case, you should always look carefully at who funds the study, why the study is being done, and what kind of conclusions are being drawn as a result of the study. Social Science readings, especially peer reviewed journals and articles, have specific features that can help you navigate the text more efficiently if you know what they are and the information the provide. Title: Specific, usually jargon-heavy. 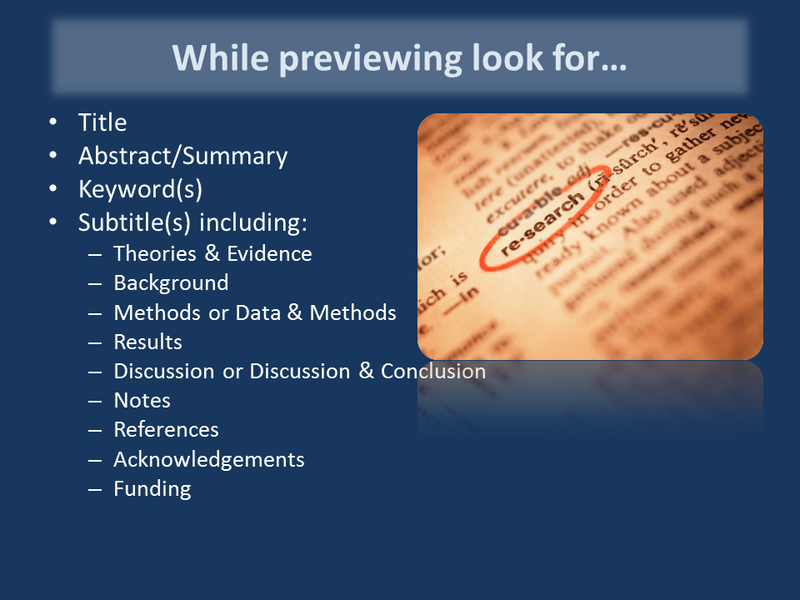 Be prepared to look up any unknown words in the title as you know they’ll be important to the rest of the text. Abstract: Short, usually one paragraph summary/overview of the study and information collected with the outcome of the study. Use this to familiarize yourself with the material. Key Words: Jargon/terms used for search purposes but also terms you should know before reading. Make sure you look them up if they are unfamiliar. Background: gives background on the study. Important because: explains related studies, background information about the study, and/or the researcher(s), and the motivations of the author(s). Theories & Evidence: presents the question the author hopes to answer, along with evidence they may be using as support. Important because: this section will usually present the hypothesis of the study as well as the preliminary evidence that may or may not support the initial hypothesis. Methods or Data & Methods: describes how the study was done, how data was collected, and what was recorded and why. Important because: it explains the way the author(s)/researcher(s) set up the study, who was involved (patients, volunteers, etc. ), the size of the study, what data was kept, and why. Results: the results of the study, usually recorded quantitatively (with numbers or statistics) along with the author’s interpretations of how the support or do not support the hypothesis. Important because: goes into detail of the results; it’s heavy on numbers but important if you need information to support a hypothesis of your own. Discussion and/or Conclusion: an in-depth look at the data, usually to eliminate any misinterpretations of the data or explain any inconsistencies that may have arisen in the course of the study. Important because: it talks about why the results of the study support or deny the hypothesis, including details about statistical analysis, etc. Notes: Any extra information the author feels important but does not directly fall into any of the other sub-headings. Important because: there may be other information about the study, including extra data, related arguments, or subsequent additions or thoughts on the study or other studies that are similar. References: Any outside sources, studies, data, or information the author uses to support or argue the hypothesis. Important because: allows the reader to check sources; evaluate the author’s previous research, and connections between ideas. Acknowledgements: Usually thanking the people who took part in the study, supported the author/researcher, or assisted in some way in the course of the study. Important because: may give the reader more information about the motivations behind the study, the author’s background, or other research that has been conducted on the topic. Funding: some studies get grants or other financial support from outside sources (such as governments, private companies, or non-profit agencies); the author may want to disclose those to the reader. Important because: gives insight into who is behind the study, more motivations for the study, and any outside influence that may or may not skew the the results or the interpretations of the research. to add additional details to other source (such as lecture). Once you determine your purpose for reading you can decide how you want to read your text. If your purpose involves a more comprehensive understanding of the text, such as to do well on an exam or essay, you will want to read slowly and deliberately, annotating while you read, asking questions, and critically thinking about the material. 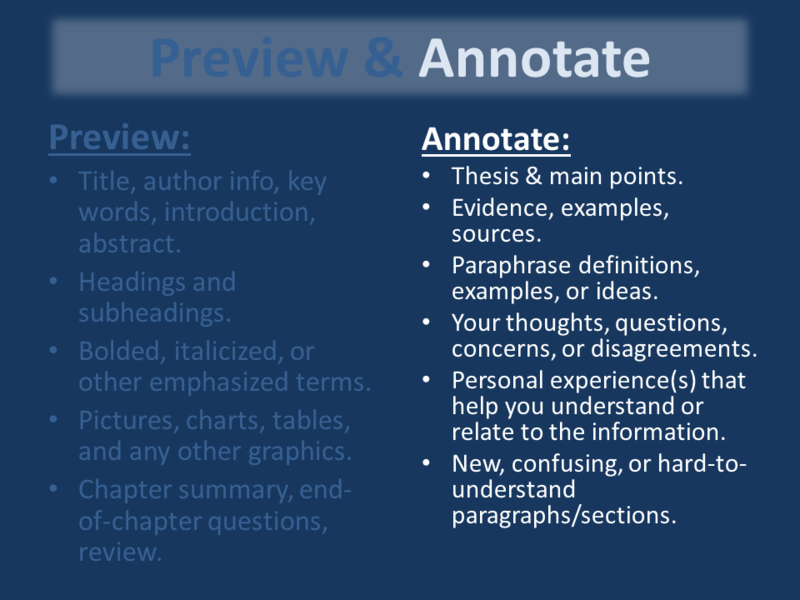 If you are reading for a class discussion, you may want to read slightly faster, focusing on only some of the most important details so you can participate and understand the discussion; you should still annotate, but you will not need to be as thorough. 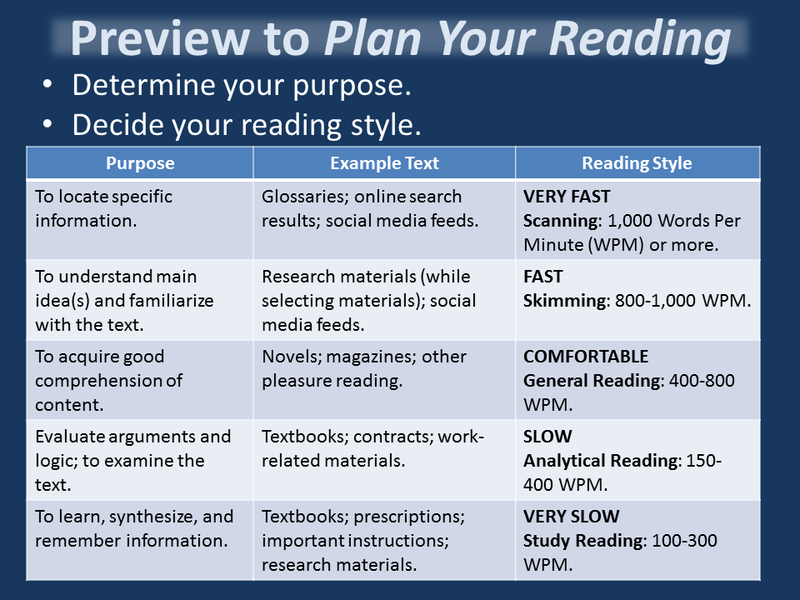 Use purpose to guide your style of reading and your reading speed. Annotation Once you finish previewing, you can go back and carefully read the chapter or article and annotate it as you go. Your annotation style should reflect your purpose for reading, the style you’ve decide to read, how much time you’ve decided to invest, and how familiar (or unfamiliar) you are with the subject. Are you reading to gain a basic understanding of the subject for a quiz or an exam? Consider marking main ideas, key terms, and important ideas. Are you planning to write a paper or essay using the article or book as a source? Mark facts, figures, statistics, and other factual information relevant to your essay topic. Are you reading to participate in a class discussion? Mark points of personal interest, ideas you agree or disagree with, questions you have, and points you want to raise to your classmates. 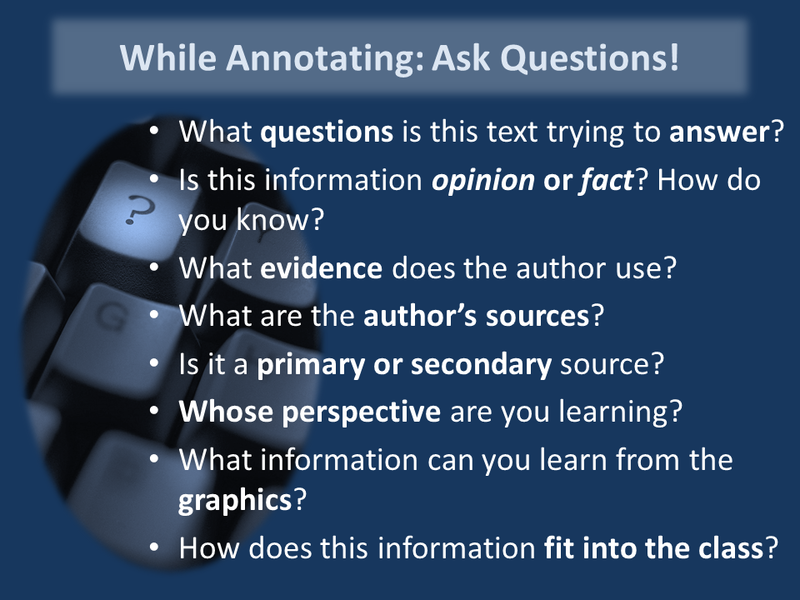 Slide 6: While Annotating – Ask Questions! What is the structure of the text? What questions is this text trying to answer? What are the author’s sources? Is this information opinion or fact? How do you know? Whose perspective(s) are we learning? What information can one learn from the graphics? How does this information fit into the class? 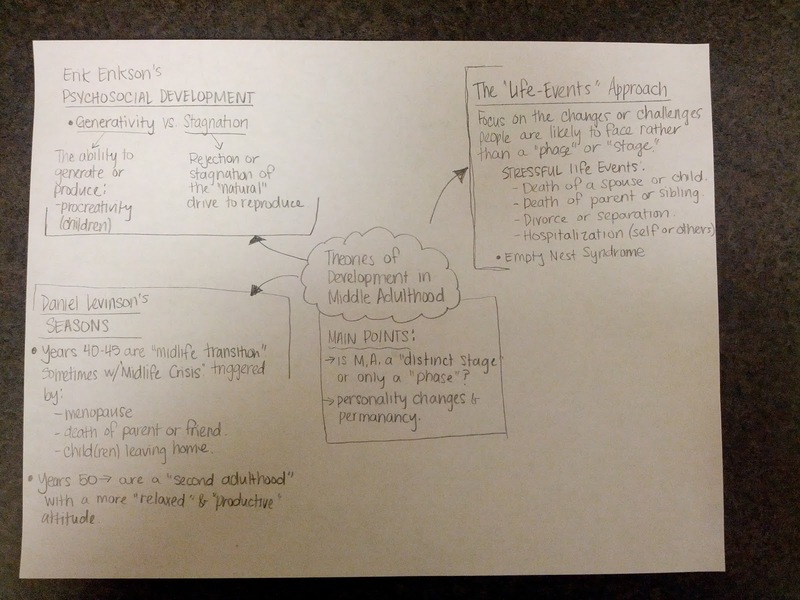 Mapping is a visual note taking style that emphasizes relationships between ideas and the “big picture.” Mapping lends itself to the social sciences as it allows you to see all the details, especially those emphasized in lecture, as well as how those details fit into the larger subject. Mapping has many different ways it can be done depending on the material itself. 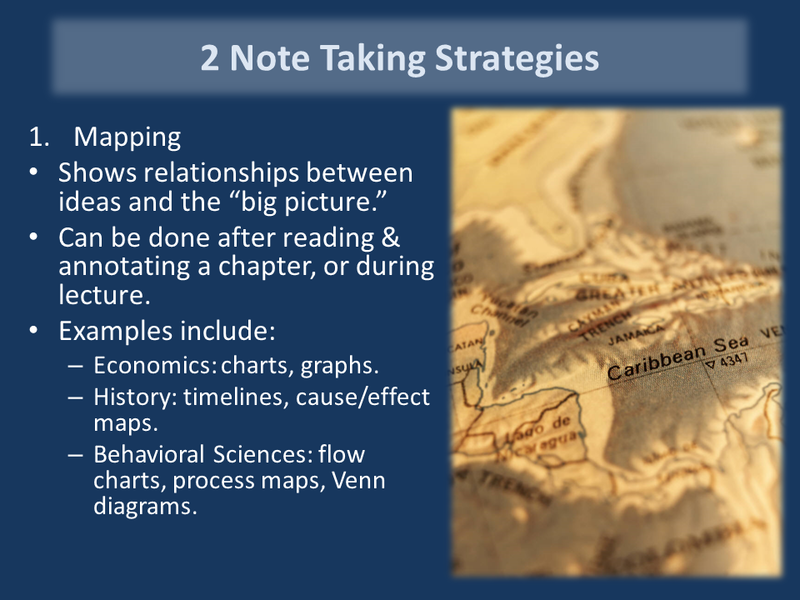 Mapping can be used as either a lecture note taking strategy or a book note taking strategy. When students think of “maps” they often think of bubbles and arrows that can go all over a page in a (sometimes) very disorganized way. Though this is one kind of mapping, there are many different kinds of maps, and you should make a point to be familiar with the different kinds so you can utilize them when you need them. 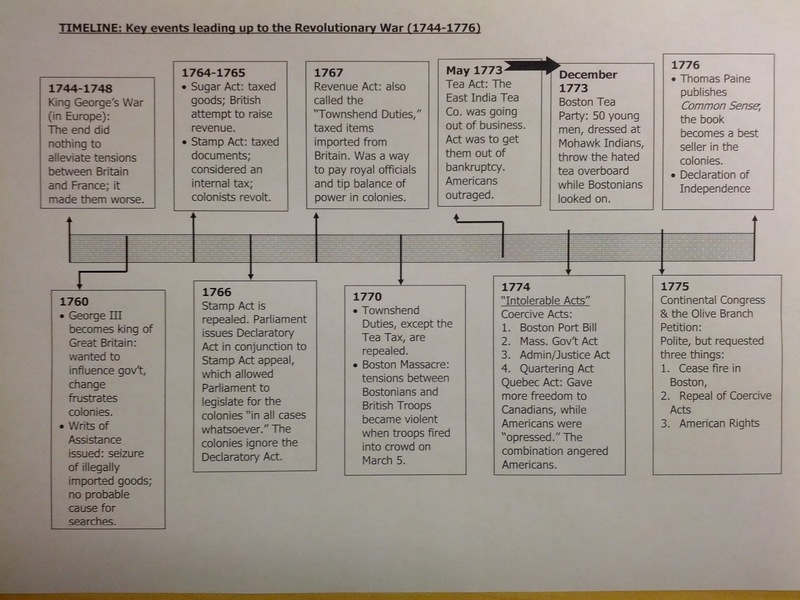 This map is from an American history text; note that it is both a timeline (chronology) as well as cause & effect (see the arrow going from May 1773 to December 1773) (Rooney, 2010). Done from a human services text, maps can help clear up differences (however subtle) between theories, people, or ideas. 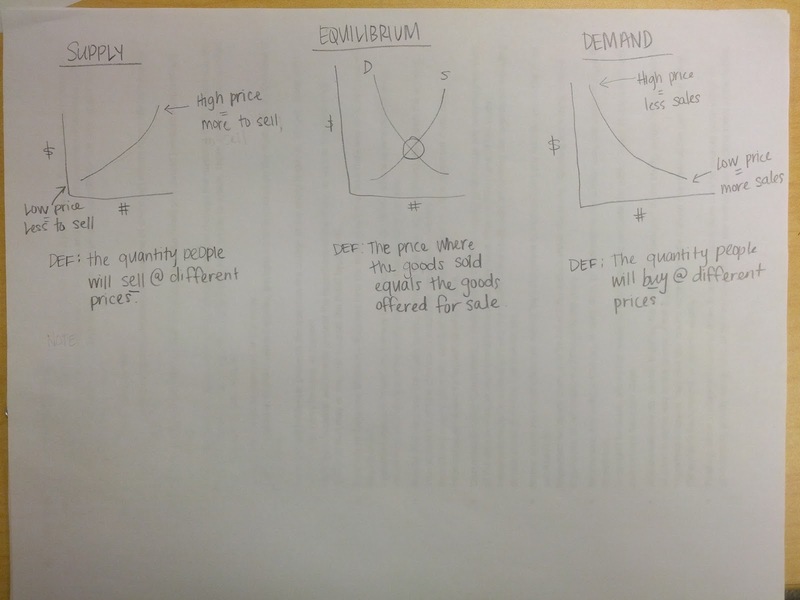 This is a map of supply & demand done from an economics text. While I’m not an Econ major, I learned a great deal from just making this map to help me make sense of the material. 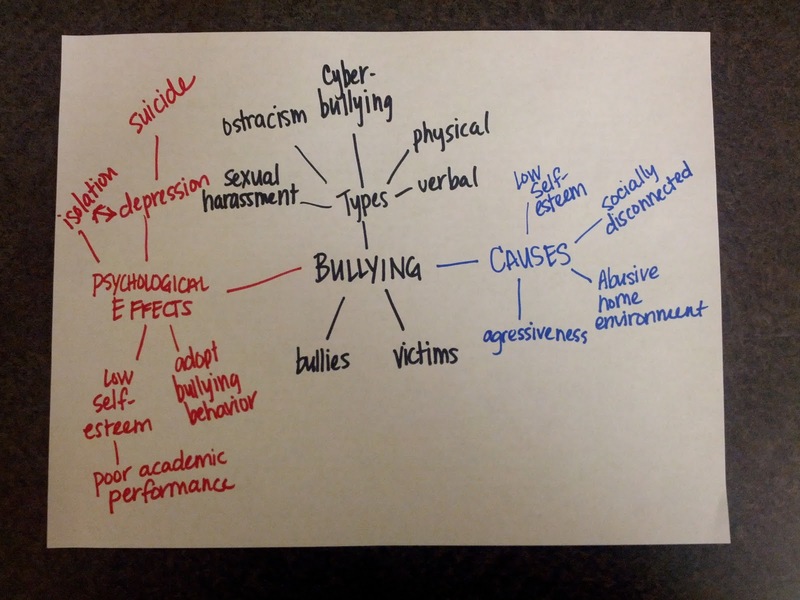 Maps can also show processes, as this one shows the process (stages) of bullying, clearly, with use of color. Economics: graphs, flow charts, process graphs. History: timelines, Venn diagrams, “comic strip” style pictures, cause/effect charts. Behavioral Sciences: flow charts, Venn diagrams, process maps, cause/effects charts. Grid Notes is another visual style of organizing information but has a structure that is “built-in” so you will find it more organized than traditional mapping. 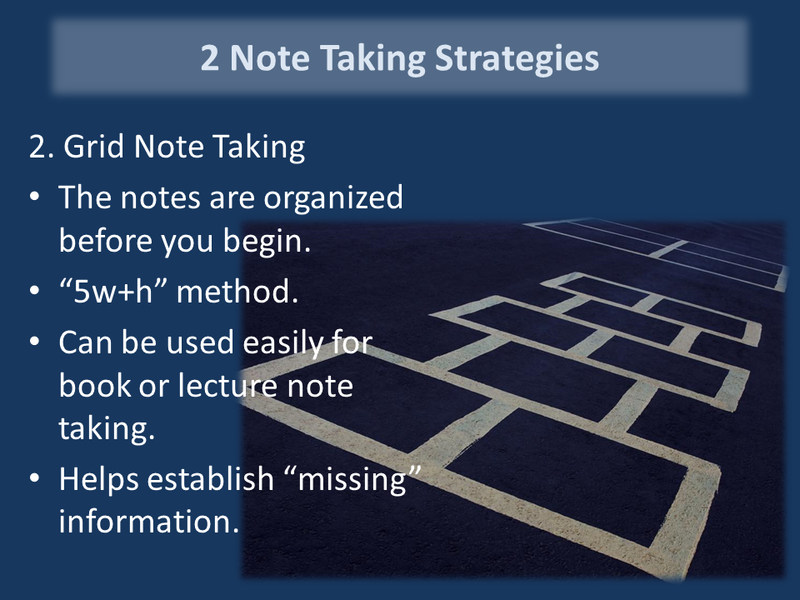 Grid Notes can be done during a lecture, while reading, or used as a way of studying information as preparation for an exam. One great thing about Grid Notes is that it makes it clear if there is any missing information. As you find information, white it in the corresponding box. For example, if your teacher mentions a name, write that name in one of the boxes under the “who” column; when your teacher gives you dates (like when that person was born, when they were active, etc.) write that in the “when” column. If, at the end of the lecture, you have an empty box, you may want to ask your teacher if that’s important information, or double check that you did not miss anything. This can also be used while reading or reviewing your text. You can add to your Grid Notes from lecture, or create a grid specifically for your textbook. Either way, Grid Notes is an excellent way to organize your information! Next > Story: Working with emergent readers.